The only way to save the universe is stop the evil army before they reaches the universe. Guide the AlienX in to space, Along the way besure to avoid galactic debris other flying vessels and traps the Vilgax has setup for stop you. To break through large obstacles or defeat extra evil villains press and hold the N key to launch a power smash. Keep an eye out for bonus items hidden within some obstacles. Press and hold SPACE BAR to activate the Super shield. If the power run out, you'll lose a change. Press N for a punch rocket. If you want to play Ben 10 Alien X Master Of The Universe 2 games online you have come to the right place! 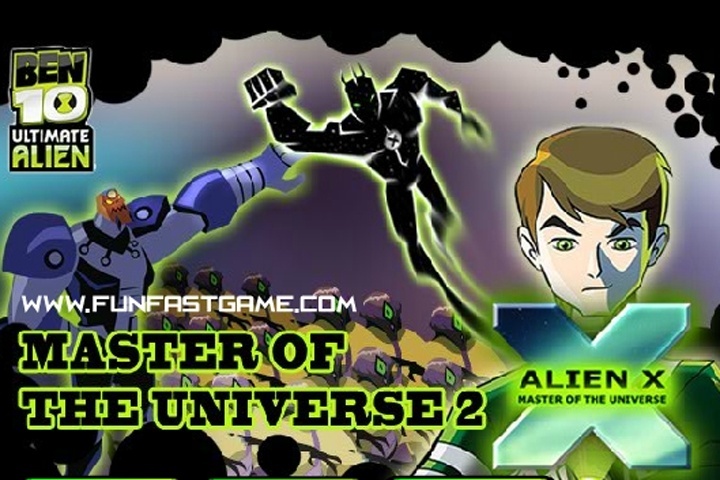 GamesLoon adds new Ben 10 Alien X Master Of The Universe 2 games every week. This is your game portal where you can find the biggest collection of free Ben 10 Alien X Master Of The Universe 2 games online. Do not forget to rate our Ben 10 Alien X Master Of The Universe 2 free online games while playing!